I’ve divided my analysis of this movie into two parts, because there are two elements to deal with. First, I want to talk about the unique situation this movie presents because it is perceived as “anti-Christian”. In the second post I will do the actual dialogue between faith and film. But this movie provides an interesting opportunity to talk about the way theology and film dialogue often unnecessarily breaks down. Some Christians will refuse to see this movie because it features an alternate view of creation that doesn’t feature God. In the film, humans are created by a superior alien race, who later wish to destroy us. To make it more controversial, director Ridley Scott said in interviews that an original script idea made it clear the aliens wished to destroy us 2,000 years ago for crucifying Jesus; who was, in fact, one of the aliens in question, come to earth to set things right. But let’s get real here. Ridley Scott is not trying to argue that an alien race created the world instead of God, any more than C.S. Lewis was trying to argue that there is a secret world hidden in your closet. This is a work of fiction. Just like Narnia, Lord of the Rings, Star Wars, or anything else of the sort. None of those stories contain God. 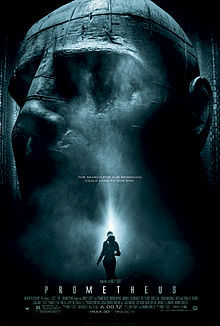 Prometheus is a movie about human origins, what it means to be created, and seeking answers to life’s biggest questions. So before we start exploring these themes, it’s important that I say this: Prometheus is a movie that invites conversation about creation and the meaning of life. And it made $50 million in one weekend. That means that $50 million worth of people went to the theatre and saw a movie that asks questions about the purpose of life, and if you do a quick internet search, you will find… they are STILL talking about it. And Christians, out of some sense of propriety, fear, “holiness”, or some combination, are not able to participate in this conversation. They won’t even see the movie. And frankly, I think this movie, thematically, is actually incredibly OPEN to a Christian worldview. Honestly, watching the movie, I found myself wondering if Ridley Scott was a Christian. Seriously. Let me for a moment say that there ARE reasons for a Christian not to watch this movie. It is rated ‘R’, which means that it is inappropriate for some viewers. If you are uncomfortable with violence or language, then this movie may not be for you. In addition, I really didn’t think this was a very good movie. I’ve been continually disappointed with ever summer movie so far besides Avengers. But, if you don’t see it, please don’t NOT see it because you think it’s anti-Christian. Because when we do that, we’re in danger of missing out on discussions we actually have something important to add to. Check back soon for the theological analysis of Prometheus. For an alien race that supposedly sent Jesus to save humanity they have an odd sense of honoring him. I’m refering to that gigantic head in the cave — the alien idol. Clearly, the ‘engineers’ have created a ‘human’ race that turned their worship away from their idol and on to, in their perception, just another human being. Now, let’s get down to the nasty. Suppose the carbon dating-type test came back with a reading of 400 years? Suppose this movie may have never been released?????? “Ridley Scott is not trying to argue that an alien race created the world instead of God, any more than C.S. Lewis was trying to argue that there is a secret world hidden in your closet” – Golden! Well done Kevin. I hated the movie but maybe your blog posts will have made it a worthwhile endeavor for me.